Accompanists’ Guild of SA’s Festival shines the light on Keyboard Accompaniment in Choral Music – The Accompanists’ Guild of SA Inc. Rarely is the art of choral accompaniment placed under the spotlight. Frequently, choral accompanying is wrongly considered to be at the bottom of the pecking order. The very nature of choral accompanying is where many accompanists quickly learn the art in a sink or swim environment. Speak to any accompanist and they’ll tell you how formative their choir accompanying experience has been in their career development. 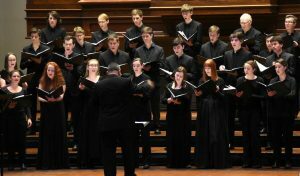 For the Accompanists’ Guild of South Australia’s 2017 Festival, techniques of choral accompaniment will be brought to the fore, under the leadership of distinguished choral conductor, Leonie Hempton, Director of Music at St Peter’s Cathedral and for many years music educator at the Special Interest Music School, Marryatville High School. 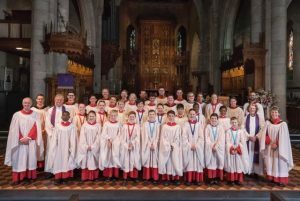 The Festival will follow the Guild’s successful three stage model of Wednesday Pilgrim Church Lunch Hour Concerts, an all-day conference on Saturday, followed by a Sunday concert highlighting the Festival Theme – for 2017 a Three Choirs Recital featuring outstanding Adelaide Choirs. The two Wednesday Pilgrim Church Lunch Hour Concerts celebrate our State’s talented young collaborative musicians beginning at 12.10 with the Guild’s Primary School Junior Ensemble Musicians (JEMs), organised and tutored by the Guild’s President, legendary SA accompanist, Monika Laczofy and at 1.10 followed by the Marryatville High School Pops Vocal Group led by their dynamic director and accompanist, Jason Hammond, performing an attractive program especially FOR the JEMs. During the Saturday conference, delegates will encounter a wide range of choral situations which highlight problems and offer solutions. Topics and presenters include: working with Youth – Young Adelaide Voices, Pop and Jazz – Marryatville High Pops Vocal, SATB for secondary students – Marryatville High School Chamber Choir, Sacred – St Peter’s Cathedral Choir, Disabled – the Tutti Choir, Tertiary talented musicians – the Elder Conservatorium Chorale and Post Graduate passionate amateurs with the Graduate Singers. A special morning guest is visiting ASO conductor, Guy Noble a former pupil and colleague of Geoffrey Parsons who will reminisce about Geoffrey and add some views on conducting choirs with orchestra. To close the Festival, St Peter’s Cathedral Choir, Young Adelaide Voices and the Elder Conservatorium Chorale will present a concert on Sunday 6 August, 2.30pm in Elder Hall Accompanied by David Heah (organ), Karen Yee and Karl Geiger (pianos). Works the three choirs will perform include: Vaughan Williams – Falstaff & the Fairies, Britten’s Rejoice in the Lamb and Australian composer, Paul Stanhope’s Losing the Plot.